The moment London fashion week was reaching its final moments, I was on the way to Italy for a quite impromptu trip to Florence and Rome – two cities I’ve visited when I was a child and clearly needed a sort of revision. Not in scorching, Italian summer, with crowds of tourists that make you remember just a flood of people going through the corridors of Uffizi, and not Caravaggio’s masterpieces. At the end of February, when Italian spring is already in full bloom, but it’s still the perfect temperature outside to wear a trench coat. And, thanks God, nearly no tourists at all. Ideal way of discovering any place, especially in Italy. Of course, I will post my favourite addresses in both of those cities in the upcoming days. 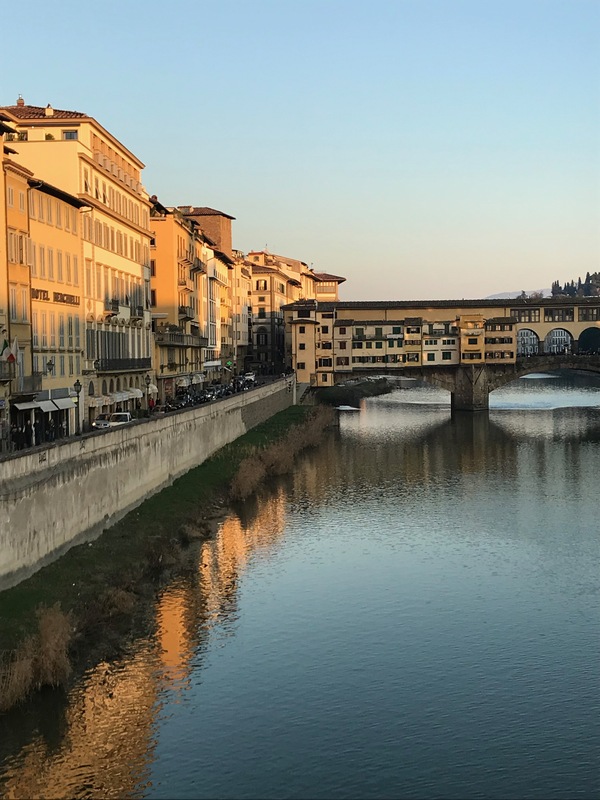 Here, I leave you with some of my favourite moments I’ve captured in Florence – Tuscany’s capital, as romantic and delicious as they say. 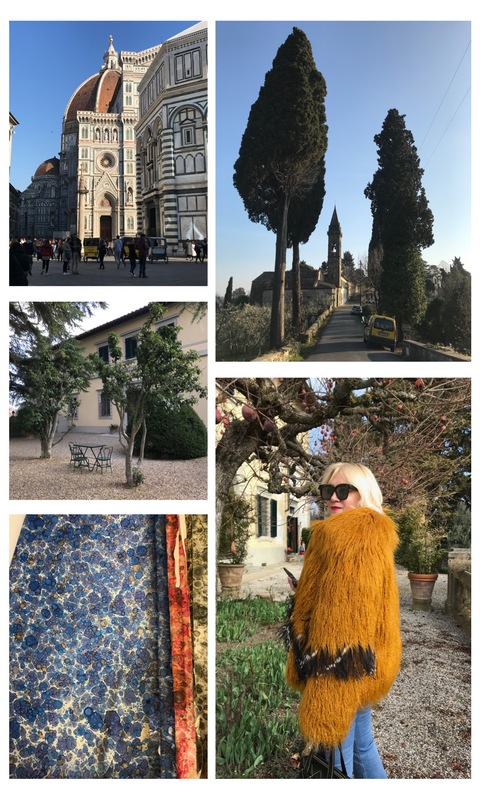 Baptistery on Piazza San Giovanni; the street that lead to our villa, hidden in the Tuscan hills just two kilometres from Florence’s city centre; patio of the villa; marble painting at Il Papiro; my mum, wearing a Dries Van Noten fur jacket. 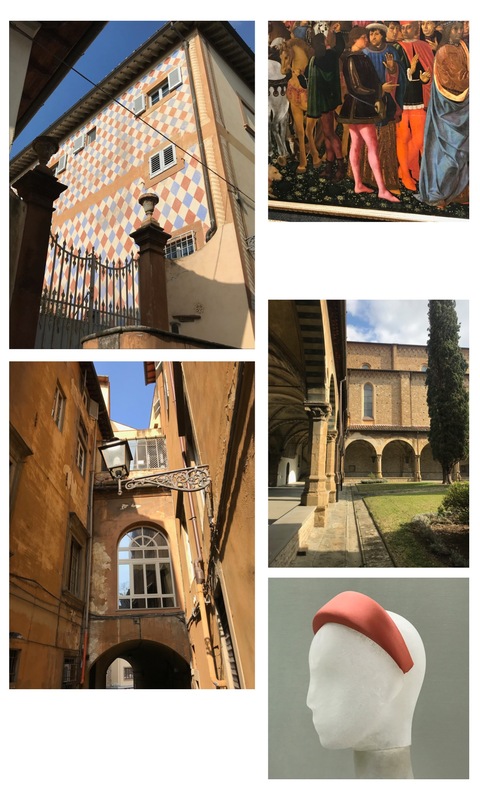 On our way to the centre; pink tights at Uffizi Gallery; typical street situation in Florence; inside of Santa Maria Novella; Prada’s headband. 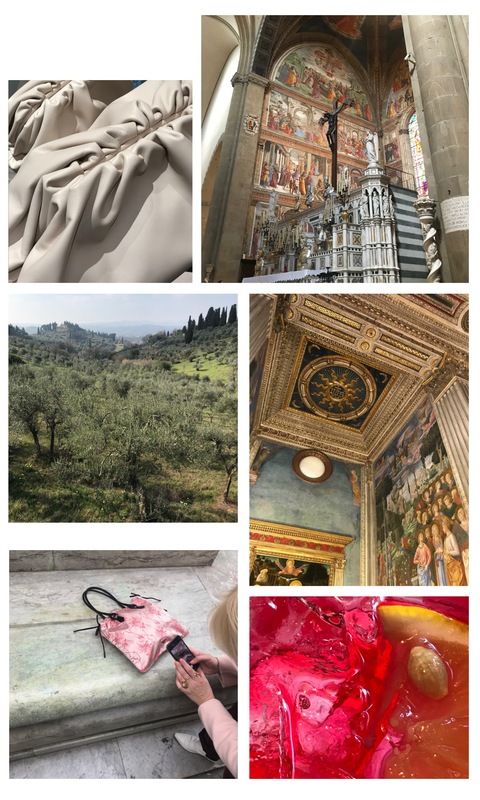 Bottega Veneta clutches that made us all lose our minds; Santa Maria Novella – completely in love with this place; a very ‘postcard from Tuscany’ clichés (which was actually our view from the villa); Medici’s Palace; mum’s vintage Prada tote from the 90s; Campari! 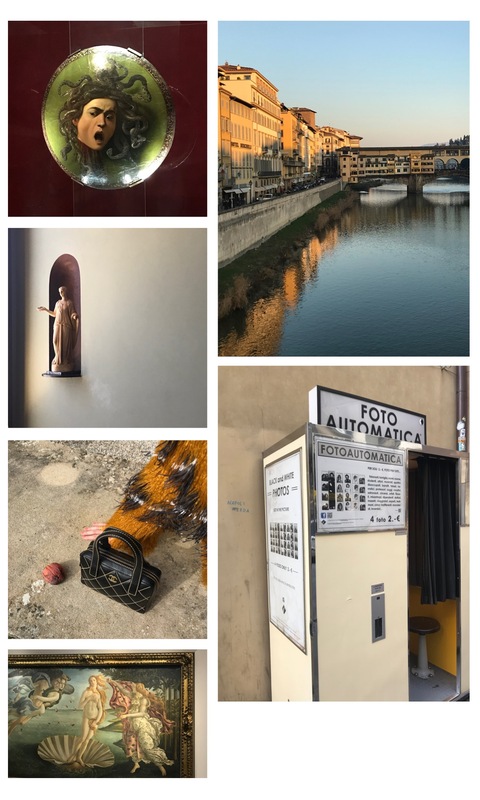 Caravaggio’s Medusa at Uffizi Gallery; Ponte Vecchio (tourist-free as well); a sculpture detail from I can’t really remember where…; another vintage from my mum, 90s Chanel; a street photo booth near the river; Botticelli’s Birth of Venus at Galleria Uffizi – it might cause a heart attack. It’s just the beginning of 2019, and we’re already talking about a fashion week. While men’s London fashion week simply seemed to be there, somewhere in the background – with such exceptions as Charles Jeffrey Loverboy’s phenomenal spectacle – the new season takes a more interesting path in Italy, in Florence specifically. Pitti Uomo invited Y/Project, the Paris-based label nailing modern-day nonchalance, to present its collection in Tuscany’s magical capital. Glenn Martens took his guests to the Cloister Grade of Santa Maria Novella, and the result was… fire. Indeed, Martens mastered his distinct touches, like distorted proportions, too-short-here-too-long-there volumes and texture clashes to a perfection of its kind, and we know it looking at his previous collections. But the autumn-winter 2019 outing for guys (and pre-fall 2019 for women) goes darker than usual, even slightly dramatic I would say. And we’re not speaking about couture-ish embroideries and ball-gowns. No. But the way the designer tailors a trench-coat, shapes a velvet jacket or elongates a chunky knit is extremely vivid. Those garments leave and breathe! And Glenn evidently experiments with that feeling of clothes in motion. 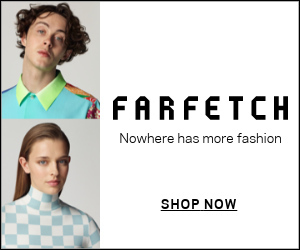 I also loved how Martens injected this flea-market edginess to his new season offering: (faux) fur stoles and floor-sweeping coats looked like stolen from your grandma, while hand-picked Persian rugs were worn as belts and scarves. The vocabulary of Y/Project grows, but you’re well aware that it’s the same soul. Whether it’s in a off-beat, Parisian location or in one of Florence’s most exquisite churches. Looking back at J.W. Anderson‘s memorable man-skirts or heavy boots covered with studs and flowers, you would never believe that the designer might suddenly do something so… simple. “No-fuss fashion basic-ness. Trying to strip everything back.” This is how Jonathan Anderson summed up his spring-summer 2018 collection presented at Florentine gardens of the Villa La Pietra (as a special guest of the season’s Pitti Uomo). And then he added, “I think this is the first season I’ve tried everything on myself. It was like going back into yourself.” Even the jeans are cut in the way he really likes it. And I like this type of cut, too – slightly baggy, cropped. Also, who doesn’t love a pair of off-duty Converse? Anderson collaborated with the sneakers brand for the upcoming season. Multicoloured heart patches bring on the hippie mood of carefree, summer nights. Chunky knits and tattered-looking jackets will be the perfect choice for a breezy beach day. Sometimes it’s worth going chinos and loose t-shirts, to just settle down and chill. In the race of fancy venues for the pre-spring collections, Gucci took their guests to the most Italian city – Florence. And specificaly, to the Palantine gallery of the Palazzo Pitti, known for its ornamental interiors. I wouldn’t be honest with myself if I started to wow and oh over Alessandro Michele‘s latest outing, which is twice richer in literally everything than usual. But what really impressed me was the way Michele went ironic with his up-to-date achievement at Gucci. He didn’t only turn the brand into international commercial prosperity. Have you met some of the Instagram ladies, who wear, breath and think only GUCCI? They’re seriously obsessed with the brand, wearing dozens of Gucci rings at a time and taking total runway looks to the streets. Michele has one, meaningful reply to that mania of his creation: Guccification. At least, some of the t-shirts from his resort 2018 collection had this slogan on.